Review Claims: CLA & Fish Oil Improve "Anabolic" Effects of Exercise - What Does the SuppVersity Sniff Test Say? A bigger biceps and less body fat to cover your precious gains? At least for CLA this has in fact been observed in a human study (see figure 1). About two weeks ago, I stumbled across an interesting paper that had just been published in the peer-reviewed journal Nutrients, filed it and got so much to do that I would almost have forgotten about it. When I was just thinking about which topic to address next, I did yet remember the auspicious conclusion to the abstract, which says "we can hypothesize that fat supplements may improve the anabolic effect of exercise." (Macaluso. 2013). "May" and "hypothesis", those are terms I like and since fish oil and CLA were implicated in the previous lines, I suppose you are going to like it as well. So what would be more obvious than to apply the "SuppVersity Sniff Test" (I am beginning to like this term, Carl often uses on the Science Round-Up) to this ostensibly well-researched review of the literature? "May improve the anabolic effect of exercise"
Usually things that "may" do just that, namely "improve the anabolic effect of exercise" end up in a pricey and useless testosterone booster. Personally, I don't know of any test booster though, which boasts that fish oil or CLA were it's main ingredients and without taking away too much of the results of this sniff test, I can already tell you that there is a good reason for why this is the case: It's even less likely to produce significant effects than the next best herb that "grows but in one place" in the Amazonian rain forest, where the CEO of company X harvests it at the hazard of his own life... ah, you know that spiel, so I don't have to repeat it here. If you take a look at the tables the researchers provide as part of their review and have basic mathematical and reading skills, it's not difficult to count the number of which would remotely support the notion that fish or CLA supplementation have any effects at all: It's 5 out of 9 for fish oil and 4 out of 7 for CLA. Certainly reason enough to "hypothesize" a bit. They probably ain't anabolic either, but could help you to stay lean on a bulk: DHA-phospholipid, as you would find them in krill vs. common fish oil supplements (learn more). would qualify as convincing evidence for any "anabolic effects" - in fact, even if we were talking about ergognenic effects in general, only the study by Guezennec would survive 2nd phase of the Sniff Test. Now, what's interesting about the Guezennec study, though, is that the "beneficial" effects (a profound decrease red blood cell deformability; RCD) were hypoxia specific and could easily turn against you. After all, one of the reasons athlete "train high and compete low" (meaning they train at high altitudes with less oxygen in the air and thus hypoxic conditions to outperform the competition at sea level) is that this will increase the production of red blood cells. Now guess why that happens!? Correct! It's a result of the hemolytic effect of hypoxic training... now, what will happens if you copy the 6g /day EPA-max supplementation regimen of the 19-38 years old guys in the Guezennec study? Right, this effect will be absent. I wouldn't go so far and call this "ergolytic", but you could certainly make a point that huge amounts of EPA are - at least in this scenario - anti-ergogenic. So, if even the widely hailed fish oil has little data to support its usefulness as an ergogenic supplement for athletes and aspiring physical culturists, what about CLA, then? I mean, we all know that the benefits researchers observed in human trials were miles apart from what they had expected to happen based on previous experiments in rodents (click on the image to the right to be redirected to a study, where the CLA treated ice dropped 77% body fat and did nevertheless display statistically significant increases in endurance capacity). In July 2012 I wrote about what I believe is the unquestionably most impressive study on the fat burning and endurance enhancing effects of conjugated linolic acid. 77% body fat reduction - that's bordering lipodystrophy. The dosage used in this study would be roughly equivalent to 30g/day for human being and supports the notion that profound effects are only observed with amounts of CLA that have yet not been administered to humans in controlled trials (learn more)! *Addendum: Anonymous pointed out correctly, that the figures in the above quotation (which is dirertly from the FT) are inconsistent. 0.5% would be only 5.6g. I guess that's a typo in the Dilzer study, because the Malpuech-Bruger study they reference says "a daily intake of 0.70 g/kg body mass was effective in mice". (Malpuech-Bruger. 2004) - sloppily as they are, they don't say that this is already in human equivalents, though. That becomes clear in the next sentence only, which says "A value of 0.70 g/kg body mass in humans would correspond to a daily intake of 56 g of CLA." (ibid.) The July 2012 study I reference under the image to the right used a HED of ~30g (learn more), so even if the exact figures are questionable, the argument obviously still holds. Since the same goes for studies investigating the "anabolic" effects the abstract to Macaluso et al. 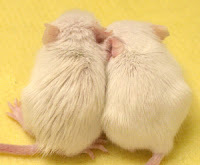 's review explicitly mentions, chances are that increases in endurance performance, as they were observed in the previously mentioned rodent study (read the full story, here), were likewise species or at least dosage specific. Is CLA "anabolic" or at least ergogenic? If we take a look at the 7 studies the researchers included in their review (I guess you will be hard-pressed to find more than those seven, as CLA is not exactly the typical supplement researchers use as an ergogenic), we can easily exclude three of them. In these studies that were conducted on healthy young women, trained male bodybuilders and physically active men and women, supplementation with 3g, 6g and 3.9g/day of CLA did exactly nothing. Improvements in body composition were observed by Thom (2001), Colakoglu (2006) and Pinkonski (2006); all studies were placebo controlled and the participants were physically active or at least healthy men (only in the Thom study) and women who consumed 1.8, 3.6 and 5g of CLA per day. While the former two studies by Tho and Colakoglu used exhaustive and medium intensity endurance programs, the study by Pinkonski et al. used a stardardized full-body workout with 12 exercises ranging from leg presses, bench and shoulder presses, to lat pull downs, biceps curls, and some core exercises. Each exercise was performed three times per week consisting of 3–4 sets of 4–10 repetitions at approximately 75–90% of one-repetition maximum (1RM). This protocol and the high number of study participants (76 men and women) and their training status - the majority had more than 2 years of weight training experience under their belts - make the results of the Pinkoski study so interesting for us. The results, on the other hand (cf. figure 1), are not exactly earth shattering, especially in view of the fact that only the fat loss and the increase in biceps size reached statistical significance and that despite a pretty high number of participants. Whether or not CLA really is "anabolic" and not "just" a mediocre fat burner has thus still to be determined. Increases in testosterone, as Macaluso et al. observed them in 10 "physically active" male subjects (age, 27.4) in a previous study in response to 6g CLA per day, on the other hand, would probably qualify as "anabolic" if the latter had not been measure right the workouts, as part of a short 3-week study with no corresponding effects on body composition (Macaluso. 2012). The latter should actually not come as a surprise to any seasoned SuppVersity student. After all you've learned that (1) endocrine induced changes in body composition take their time in the Intermittent Thoughts on Building Muscle, that (2) the role of testosterone levels in the normal range in the whole process is fundamentally overrated and (3) that the seminal paper by West & Phillips, on which the data in figure 2 is based, clearly refutes the notion that post-workout increases in testosterone have any impact on skeletal muscle hypertrophy. If we also take into account that numerous rodent studies do in fact support the notion that CLA posses "ergogenic", yet not necessarily "anabolic" qualities. Macaluso et al. are certainly correct, when they conclude their paper with the scientific equivalent to "And they lived happily ever after" stating that "additional research". Ah, you see I am diverting to the fat loss effects again. And if we are honest, the results of this review do actually only confirm that what you've read here at the SuppVersity roughly 3 months ago the combination of CLA + DHA could turn out to be a safe and effective fat burner (learn more), if we would finally see adequately doses, long(er) term supplementation trials in humans. As ar as the "anabolic" nature of either of them, i.e. EPA + DHA or cis-9,trans-11 and trans-10,cis-12 CLA. The jury may still be out there, but the verdict is - at least in the case of regular fish oil almost certainly "not guilty", .. ah I mean, "not anabolic". Brilla, L.R. ; Landerholm, T.E. Effect of fish oil supplementation and exercise on serum lipids and aerobic fitness. J. Sports Med. Phys. Fitness 1990, 30, 173–180. submaximal exercise in elite Australian Rules footballers. J. Sci. Med. Sport 2009, 12, 503–507. Colakoglu, S.; Colakoglu, M.; Taneli, F.; Cetinoz, F.; Turkmen, M. Cumulative effects of conjugated linoleic acid and exercise on endurance development, body composition, serum leptin and insulin levels. J. Sports Med. Phys. Fitness 2006, 46, 570–577. Dilzer A, Park Y. Implication of conjugated linoleic acid (CLA) in human health. Crit Rev Food Sci Nutr. 2012;52(6):488-513. Ernst, E.; Saradeth, T.; Achhammer, G. n-3 fatty acids and acute-phase proteins. Eur. J. Clin. Guezennec, C.Y. ; Nadaud, J.F. ; Satabin, P.; Leger, F.; Lafargue, P. Influence of polyunsaturated fatty acid diet on the hemorrheological response to physical exercise in hypoxia. Int. J. Sports Med. 1989, 10, 286–291. Lenn, J.; Uhl, T.; Mattacola, C.; Boissonneault, G.; Yates, J.; Ibrahim, W.; Bruckner, G. The effects of fish oil and isoflavones on delayed onset muscle soreness. Med. Sci. Sports Exerc. 2002, 34, 1605–1613. Macaluso, F.M. ; Catanese, P.; Ardizzone N.M.; Marino Gammazza, A.; Bonsignore, G.; Lo Giudice, G.; Stampone, T.; Barone, R.; Farina, F.; Di Felice, V. Effect of conjugated linoleic acid on testosterone levels in vitro and in vivo. J. Strength Cond. Res. 2012, 26, 1667–1674. Macaluso F, Barone T, Catanese P, Carini F, Rizzuto L, Farina F, Di Felice V. Do Fat Supplements Increase Physical Performance? Nutrients 2013; 5:509-524. Malpuech-Brugère C, Verboeket-van de Venne WP, Mensink RP, Arnal MA, Morio B, Brandolini M, Saebo A, Lassel TS, Chardigny JM, Sébédio JL, Beaufrère B. Effects of two conjugated linoleic Acid isomers on body fat mass in overweight humans. Obes Res. 2004 Apr;12(4):591-8. Oostenbrug, G.S. ; Mensink, R.P. ; Hardeman, M.R. ; De Vries, T.; Brouns, F.; Hornstra, G. Exercise performance, red blood cell deformability, and lipid peroxidation: Effects of fish oil and vitamin E. J. Appl. Physiol. 1997, 83, 746–752. Peoples, G.E. ; McLennan, P.L. ; Howe, P.R. ; Groeller, H. Fish oil reduces heart rate and oxygen consumption during exercise. J. Cardiovasc. Pharmacol. 2008, 52, 540–547.. Peoples, G.E. ; McLennan, P.L. ; Howe, P.R. ; Groeller, H. Fish oil reduces heart rate and oxygen consumption during exercise. J. Cardiovasc. Pharmacol. 2008, 52, 540–547. Pinkoski, C.; Chilibeck, P.D. ; Candow, D.G. ; Esliger, D.; Ewaschuk, J.B.; Facci, M.; Farthing, J.P.; Zello, G.A. The effects of conjugated linoleic acid supplementation during resistance training. Med. Sci. Sports Exerc. 2006, 38, 339–348. Thom, E.; Wadstein, J.; Gudmundsen, O. Conjugated linoleic acid reduces body fat in healthy exercising humans. J. Int. Med. Res. 2001, 29, 392–396. Toft, A.D.; Thorn, M.; Ostrowski, K.; Asp, S.; Moller, K.; Iversen, S.; Hermann, C.; Sondergaard, S.R. ; Pedersen, B.K. N-3 polyunsaturated fatty acids do not affect cytokine response to strenuous exercise. J. Appl. Physiol. 2000, 89, 2401–2406.